Looking for a meaningful volunteer opportunity? Become a NIRP volunteer! Why not spend your summer vacation, school holiday, gap year or university break with us? NIRP welcomes volunteers of all ages and nationalities to contribute in our ongoing programme activities. The key to ending poverty and creating harmony throughout the world begins with each individual person and how they choose to live their lives. One person may not be able to change the World, but they can change a life! Experience the happiness, struggles, aspirations and dreams of the people you assist – all while discovering the beauty, history and culture of Uganda. First of all, NIRP is a local Ugandan organization. 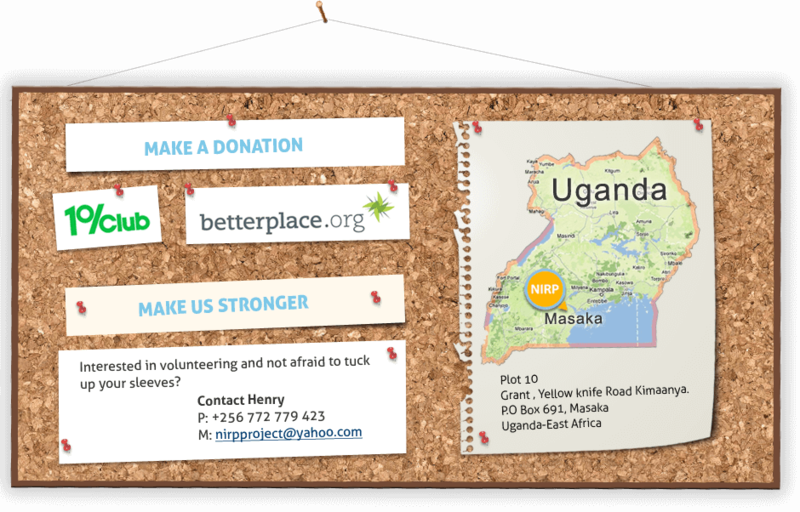 A big number of international organizations offer a variety of volunteer placements in our country. Most of them are doing great work and many communities benefit from their presence. However, we are convinced that we know best about the needs of the people we serve. We are all members of this community and maintain a close contact to the beneficiaries of our help. We invite you to help us to improve the lives of our community members. Furthermore, we are particularly interested in your skills and qualifications and not in your money. That is the reason why we charge reasonable participation fees, which will cover your accommodation and everyday living expenses including transport, food and a contribution to our ongoing project activities. You will not be asked to make any further donations or fundraisings.We know this remains an issue with some volunteer organizations, but we are not one of them. Of course we are more than thankful for every financial contribution to our project, but this remains your own decision/good will. Flights, insurance, visas, vaccinations, departure from the program. We recommend you allow a weekly budget of US $30 for your other expenses such as bottled water, personal items, beverages, and entertainment. education for AIDS orphans at Mulira Orphanage and restoration center. supporting children in arts and sports at selected local schools. Others volunteers, especially those completing an internship or conducting a research, design and implement their own projects under the supervision and with the support of NIRP staff and community workers. All new projects must of course complement NIRP’s overarching aims. However, we highly encourage you to think about a way in which your own skills and qualifications can contribute the most to our project. This enables us to offer you a tailor made volunteer placement that fits to your personality and your preferences. You will live together with selected Ugandan host families. Every volunteer will have his or her own room, with electricity, flushing toilets and a comfortable bed. Delicious Ugandan meals will be prepared for you and living with a family will provide you with an in depth experience of an African everyday life that you would not have if you lived in a guest house or hostel. However, this option remains also open to you, not far from Henrys place is a backpacker hostel that offers basic accommodation in small bandas or dormitories. First of all, we expect you to be open minded and willing to get in close contact with our local community and culture.Most of our projects require no specific skillsets. Flexibility and the desire to help are the perfect qualifications. However, do you have a unique technical or educational background that is an in-demand skill-set?If yes, we highly encourage people with special skills and trainings to contribute to our organization. We are happy about every knowledge and action shared with us that benefits our cause and our clients. A basic knowledge of the English language is compulsory, in order to interact with us. Still, some community members only speak Luganda.Our volunteer coordinator Martha will translate for you the most but be prepared to learn some basic phrases in our local language. You will experience that people will appreciate this a lot. Since you are dealing with vulnerable people mutual respect and a sufficient knowledge of our cultural habits are essential. But don’t worry, our staff will prepare you in detail and you will experience that Ugandans are very hospitable and open towards foreign people. Get in contact with us! Of course we need to get to know you better. Before applying, engage in self-reflection to identify exactly what kind of experience you are looking for. Tell us, what makes you move? Where do you see your strengths and how can they contribute to our organization? Our volunteer ambassador Sasha is looking forward to receive your E-Mails. After we received your application our volunteer ambassador Sasha will get in contact with you. He worked with us as an intern and manages now our recruiting processes. He is a real Uganda expert and will provide you with all the needed information about the country, its culture, and our organization.